Located on the banks of the river Tay in Perth our serviced holiday apartments are perfect for a business or holiday rental. Offering self catering short term lets our apartments are well positioned as a base for touring, visiting relatives or friends, golfing in famous courses of Perthshire, hillwalking or fishing in the famous river Tay. Both apartments have stunning views out over the flowing river to the city of Perth and beyond. 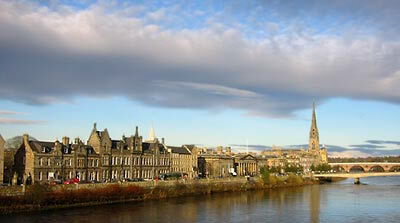 Perth, Scotland's 7th city is on your doortstep with its many restaurants, cafes, cinema and theatres. Also known as the Fair City, there are numerous reminders of the medieval past. Pause in the restaurant quarter and enjoy a coffee as you soak up the history surrounding you with St Johns Kirk dating back to medieval times. Or visit the many visitor attractions including Lower city mills, the black watch museum, Scone Palace, Perth Concert Hall, Huntingtower Castle and Elcho Castle. Situated on the first floor of a Victorian Terrace, this holiday apartment has wonderful views across the River Tay towards Kinnoull Hill. Accommodation includes, 2 bedrooms, one double, one twin, kitchen, lounge and shower room. Stay in an executive style award winning Apartment development with stunning views across the River Tay towards the Old Perth Bridge. This apartment has private parking, 2 bedrooms, one with en suite, kitchen, dining and lounge area with balcony. Our Holiday Apartments in Perth are let on a weekly and short break basis. Contact us for Short term lets of 3 or 4 days which start on Friday, 4 nights start on Monday.